Chinatown Celebrates 3rd Annual Chinese Food Festival and Los Angeles Chinatown's 68th Anniversary June 24 & 25, 2006. 06.23.06 -- A mini Chinatown Farmers Market will be one of many attractions featured at Chinatown's 3rd Annual Chinese Food Festival. The festival runs Saturday from 12noon to 8 p.m., and Sunday from 10:30 a.m. to 6 p.m. and will include Chinese music and dance, martial arts and acrobatics demonstrations, Chinese puppet show, cooking demonstrations, food tastings, and more. For more information see http://www.chinesefoodfestivalla.com/festival.html. (Click on "Festival"). Oxnard Certified Farmers' Market Celebrates 16th Anniversary. 06.03.06 -- Congratulations to Desire Ventura and everyone at the Oxnard Certified Farmers' Market for the market's success since 1990. On June 15, 2006, the Oxnard Certified Farmers' Market will celebrate its Sweet 16th Birthday. Market Manager Desire Ventura has published a special coupon in the local papers as a birthday present to the neighborhood. There will be a special Ann's Bakery sheet cake with half mango and half mocha filing and a whipped cream frosting on hand for everyone's delight. " Duchicella " will entertain the market with wonderful South American music. So, how many more reasons do you need to join Desire and all the growers at the Oxnard Certified Farmers' Market for Birthday celebrations? Everyone is invited! Southland Opens Ladera Ranch Certified Farmers' Market on Friday, May 5, 2006. 04.06.06 -- Southland will open a new certified farmers' market at Ladera Ranch in Orange County on May 5, 2006. The year-round market will operate every Friday from 9:00 AM to 1:00 PM. Mary Hillebrecht has been chosen as the market manager. The Ladera Ranch market is the first Southland market to be located in Orange County. We are excited to be working in partnership with the Ladera Ranch community to provide the latest in Southern California farmers' markets. We have every reason to believe that Ladera Ranch will be one of the premier certified farmers' markets in California. Click here for market location & map (scroll to Ladera Ranch entry). 04.05.06 -- The City of Chino will open a seasonal certified farmers' market on Wednesday evenings from 5:00 PM to 9:00 PM from June 14, 2006 to August 31, 2006. Southland Board Member Harry Brown-Hiegel has contracted to manage the market. Anyone interested in participating in this new market may contact Howell Tumlin at 310-481-0167 or email him at howell@sfma.net. 04.05.06 -- The Project for Public Spaces in cooperation with the Ford Foundation has awarded a $100,000 grant to Southland to fund an innovative partnership with the Los Angeles Unified School District that will develop eight new certified farmers' markets on Los Angeles' school campuses. 11.14.05 -- The new Kaiser Permanente Medical Center at Riverside Certified Farmers' Market will open this Friday, November 18, 2005. The market will serve the staff of the hospital and the Kaiser Permanente members visiting the medical center. This is the second market that Southland has opened in partnership with Kaiser Permanente this year. 11.14.05 -- The Certified Farmers' Market Advisory Committee will meet on Tuesday, November 15, 2005 from 2 PM - 5 PM in Ventura. The Advisory Committee will take up the issue of establishing due process requirements for markets that take an action against a grower and other matters. Oxnard Certified Farmers' Market Celebrates 14th Birthday! 6.16.05 -- Oxnard Certified Farmers' Market celebrates its 14th birthday today with music, prizes, and birthday cake. Drawings for prizes will be held every 1/2 hour. Be there at noon for birthday cake and a special drawing during which 6 prizes will be awarded. Farmers' Market gift certificates will be given out and a free plant will be given to the 1st 25 visitors to the DJ's booth. The Oxnard Certified Farmers' Market runs from 9am to 1pm. WIC and Senior farmers' market coupons are accepted. Ample parking is available in the new parking structure at 4th & B streets. 4.18.05 -- Southland will open two new certified farmers' markets in May. The Panorama City Certified Farmers' Market will open on May 20, 2005 at a location one block north of the intersection of Roscoe Boulevard and Van Nuys Boulevard in Panorama City. The market will operate weekly on Friday evenings from 4:00 PM to 8:00 PM. This market will be developed in partnership with the Valley Economic Development Center. The second market will be located at the Kaiser Permanente Foundation Hospital in Fontana and will open on May 27, 2005. Certified producers interested in selling at either of these markets should contact Southland at 310-481-0167. 4.18.05 -- The Los Angeles City Council will consider an ordinance next week that would effectively eliminate the current practice of waiving special event and street closure fees for certified farmers' markets operating on Los Angeles city streets. It would appear that markets would be required to pay more than $500 per market day in fees to the City. Southland urges the City to continue to exempt those certified farmers' markets that consist of no fewer than 75% farmers. Click here for the full text of the Southland letter to the Los Angeles City Council. Introducing a New Weekly Publication: "Southland Market News"
3.29.05 -- Southland announces the creation a new service for member markets with the introduction of the "Southland Market News" last week. This weekly, one-page news bulletin is emailed on Mondays to Southland member markets for distribution to growers and vendors on market day. The one-page format makes the News simple to copy and pass out during the market. Past editions of the Southland Market News can be found by clicking on "Market News" found under "About Southland Farmers' Market Assn." on the navigation bar to the left. 3.21.05 -- The Los Angeles County Department of Health Services recently took the unprecedented action of banning sales of wild mushrooms in certified farmers' markets. The reason given was that the source of the wild mushrooms was not "an approved source" according to their definition. David West, a Southland member and long time vendor of wild mushrooms at the Santa Monica Certified Farmers' Market was essentially put out of business. Protests from customers and calls to the County Supervisors advising them that all wild mushrooms come from the same source added pressure on the Department of Health Services. In the end, the Department backed off its ban on wild mushrooms in Los Angeles County. The reason they gave was that it was a State matter to develop standards for approved sources of wild mushrooms. We think the Department simply got in over its political head on a decision that made sense to no one. See Southland's letter to the Director of Health Services and the most recent Los Angeles Times Article. Much credit for the change in the Department's decision goes to David West, who was persuasive in getting customers and supporters to call and write on his behalf. Laura Avery, Southland President and Supervisor of the Santa Monica Farmers' Markets, championed David's cause and was significant in getting the word out to radio listeners and market participants. Southland proposes 17 basic reforms to the California certified farmers' market program. and here for the text of the legislative proposal. 2.14.05 -- Southland and the Santa Monica Farmers' Markets have been working together to implement a review of the products being sold in the market. Beginning in December 2004, Southland/Santa Monica staff selected two farms each month to audit. The audits document what is currently being sold at the market and includes a trip to the farm see the products growing at the farm. For more information on how the program works, click Southland Audit Program. Polito Family Farms, Valley Center, CA - In December, the staff completed an audit of Polito Family Farms. The audit found that all products observed being sold at the market were clearly visible at the Polito property. The audit report concludes that Polito Family Farms successfully demonstrated that it is producing the products it sells in the Santa Monica Farmers' Market. Zamora Farms, Vista, CA - In December, staff notified Zamora Farm that it would be subject to an audit of the products they sell at the Santa Monica market. The audit was never conducted, however, as Zamora Farms abruptly left the market. Efforts to contact them since have been unsuccessful. Zamora Farms will need to complete this audit before they will be allowed to re-enter Santa Monica markets. Nakamura Farms, Oxnard, CA - Staff audited Nakamura Farms in January 2005. We visited both production sites in and near Oxnard. The audit concluded that Nakamura Farms was able to demonstrate that the products being sold at the market are being grown at the farm. McGrath Family Farms, Camarillo, CA. - Staff documented the products being sold at the market by McGrath Family Farms. We observed that these products were well established and growing at the farm. The audit report concludes that McGrath Family Farms is selling products at the market that are easily seen growing at the farm. 8.4.04 -- In a decision that may effect all farmers' markets on public streets, the NTSB has cited language in the federal "Manual on Uniform Traffic Control Devises" as source of a requirement that street barriers for the Santa Monica Farmers' Market should be highly visible with three stacked bars. According to the Los Angeles Times today, the Board criticized the City's current practice of using farmers' vans and trucks to block the market's entrances. Officials said that the vehicles' gas tanks could explode if struck by a fast-moving car. Southland Opposes USDA Proposal to Allow Importation of Mexican Hass Avocados into California. 7.22.04 -- Southland was written to the USDA in opposition a proposal that would allow the importation of Mexican Hass avocados into California and the other 49 states. The Bush administration has plans to lift a 90-year old ban of importing avocados into US avocado-growing regions. Southland joins with the California Avocado Commission and other organizations to raise concerns that Mexican fruit will introduce harmful pests into California avocado groves. The deadline for written comments in July 23, 2004. You may join in opposition to this proposal by going to www.stopusda.com. 7.19.04 -- The Santa Monica Certified Farmers' Markets sales continue to grow each year. The Wednesday Market's sales lead all markets with a 17% increase over last year, the Saturday Organic Market has increased by 15%, the Saturday Pico Market by 8% and the agricultural product sales at the Sunday Market increased by 7%. Congratulations to the Santa Monica Market staff for such terrific results. 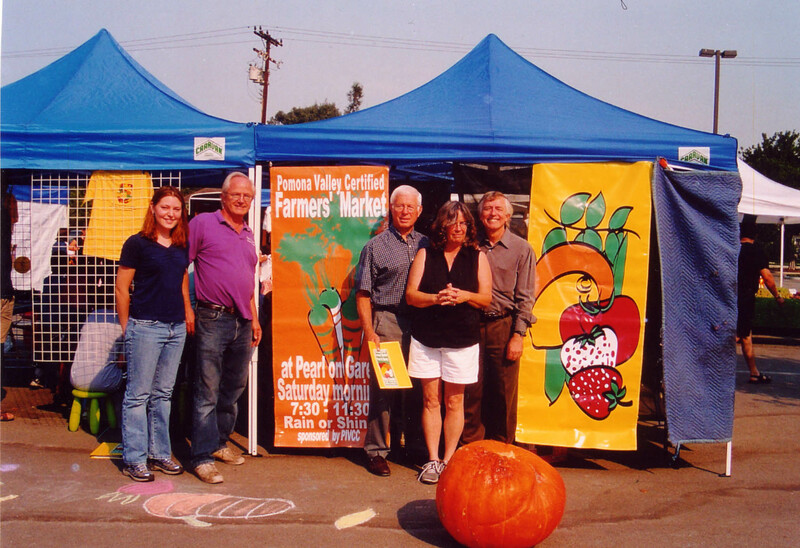 7.6.04 -- Southland President Laura Avery and Executive Director Howell Tumlin will attend the July 15, 2004 Board of Directors' Meeting of the Marin County Farmers' Markets Association in San Rafael, CA to discuss Southland's proposals for reform of the certified farmers' market program. 7.6.04 -- Southland has written a letter of concern to Health Services Director Jonathan Fielding regarding the Health Department's new policy of not accepting personal checks for payment of health permits. The Department recently returned a check issued by a local government agency under this new policy and insisted that the city involved pay via money order. 6.30.04 -- Southland is looking for approximately 500 square feet of donated office space on Los Angeles' Westside. Our current office space lease ends on August 31, 2004. If you know of anyone who may be interesting in supporting our mission with a donation of a small office space, please let us know at 310-481-0167. 6.30.04 -- Nutritional Specialist Dona Richwine will present the a newly developed video and manual designed to show other public schools how to establish their own farmers' market salad bar program tomorrow at 1:00 PM on Thursday, July 1, 2004, in the Boardroom of the Santa Monica-Malibu Unified School District offices. The SM-MUSD offices are located at 1651 16th Street, Santa Monica, CA 90404. The instructional video and supporting materials were produced as a sub-grant of Southland's Buy California Campaign Grant Funding. We are grateful to the California Department of Food and Agriculture for funding this program. Southland is looking for additional funding to enable us to duplicate these materials and make them available to any school that is interested in developing a farm-to-school salad bar program. For more, see the press release. 6.28.04 -- Southland unveiled a free website design program for Los Angeles County certified farmers' markets today at the Brentwood - Bel Air Holiday Inn. Farmers' market operators from the 84 Los Angeles County certified farmers' markets were invited to a luncheon and presentation by website designer Donna Freiermuth of Organic-Design.net to learn how a market can receive free website development. The design tools and presentation were graciously funded by the Buy California Campaign Program and the Southland Farmers' Market Association. Southland received a $100,000 Buy California Campaign grant that it has leveraged into 13 sub-grant projects generating more than $280,000 in specialty crop promotions in Los Angeles County. If you are a Los Angeles County certified farmers' market operator, and want more information, contact Howell at 310-481-0167, x-13. 6.24.04 -- The City of Redondo Beach provided a tour of the Redondo Beach Farmers' Market today for summer camp kids. This project is funded by the California Department of Food and Agriculture's Buy California Campaign Grant to encourage consumers to purchase specialty crops from California growers. CDFA Staff member Josilyn Hendricks traveled from Sacramento to attend this event and see first hand the benefits of introducing young kids to the fun of certified farmers' markets. Many thanks to John York for making this program so successful. See Redondo Beach News article for more. 6.22.04 -- Southland met with City of Los Angeles Council member Jack Weiss' staff yesterday. It was confirmed that Council member Weiss was the originator of the proposal to eliminate fee waivers for special events that require street closer/permits. Council member Weiss' staff assured us that certified farmers' markets will not be subject to the requirements of other commercial events nor expected to pay $528 per week in fees, as reported by City of Los Angeles staff. 6.16.04 -- CDFA has proposed new regulations regarding the definition of sprouts, the requirement of markets to have a current certificate and the posting of organic registration. See the CDFA Notice for the text of these proposals. Comments on these proposals must be received by CDFA by 5:00 PM, July 26, 2004. 6.15.04 -- Southland expelled the Westwood Farmers' Market from the Association for its failure to comply with the Code of Ethics, including the market's refusal to provide financial accountability to the community it serves and failure pay its annual membership fees. The Westwood Farmers' Market was organized by Southland in 1994 as a service to the Westwood Village community. The press release provides the details. On June 28, 2004, the UCLA Bruin newspaper wrote the following story about the Westwood Farmers' Market's expulsion form Southland. For the full story, click here. 6.9.04 -- Southland opposes a proposed City of Los Angeles' ordinance that would categorize certified farmers' markets as commercial events and therefore no longer eligible for special event and street closer fee waivers. We urge the City to modify the definition of commercial event to exclude certified farmers' markets where at least 75% of the vendors are farmers. For more, see letter to Los Angeles City Council. 5.23.04 -- Southland Board of Directors is scheduled to meet on the dates listed below. Please note that this schedule is subject to change. Check this website for updates. The meeting dates for 2004 are: July 18 and October 17. Meeting dates for 2005 are: January 16 and March 13. Southland's 2005 Annual Meeting is scheduled for Sunday, April 17. 5.19.04 -- A nonprofit corporation is required to file IRS Form 990 if it has annual revenues of $25,000 or more. Nonprofits that operate certified farmers' markets sometimes learn of this requirement only after being penalized for failure to file in a timely manner. The penalty for failure to file may be as much as $100/day with a maximum of $50,000. For more information, click here. The IRS also has a FAQ that may assist you. Nonprofits operating on a calendar reporting period must file by May 15th. If you have a fiscal accounting year, then you are required to file by the 15th of the fifth month after the fiscal year ends. 5.12.04 -- CACASA, the association of California county agricultural commissioners, has joined in the growing call for fundamental reform of the Certified Farmers' Market Program. CACASA presented an important discussion paper to the Certified Farmers' Market Advisory Committee this week. It lists six proposals, the sum of which would "return the Direct Marketing Program back to its original intent". Mirroring the Southland proposed reforms from the certified producer's point of view, CACASA offers a package of major and minor reforms to restore the promise of the program from the regulator's perspective. The CACASA discussion paper is an important contribution to the discussion on how to restore integrity to certified farmers' markets. Anyone who is concerned about the future of farmers' markets should read and carefully consider its suggestions. Southland is soliciting comments for these proposals from all who have an interest. Southland views the CACASA proposals as another indication that there is a growing movement of serious and committed growers, market operators and regulators who are ready to deal with the unsavory practices of a small but growing number of dishonest market operators and participants. Southland has lead this movement because we view the unaddressed abuses of farmers' markets as threatening this extraordinary program. We welcome CACASA's contribution to this effort and applaud their initiative. 5.11.04 -- The Certified Farmers' Market Advisory Committee yesterday adopted a Southland proposal regarding noncertifiable agricultural products. The Committee approved memorializing current practices while it continues to study how to address the pressing issue of value-added and processed foods in the certified farmers' market program. To see the regulation adopted by the Committee, click on the "Legislative Voice" link in the green navigation bar to the left. 4.28.04 -- The WTO has ruled in favor of Brazil's cotton growers who challenged farm U.S. subsidies for domestic cotton producers as unfair. This is the first agricultural case to successfully confront the practice of farm subsidies for agricultural products. For more, see this Washington Post Article. City of Los Angeles Looks to Certified Farmers' Markets for Revenues? 4.27.04 -- The City of Los Angeles has alerted certified farmers' markets located on Los Angeles' city streets that a proposed ordinance would eliminate the authority of LA City Council members to waive street closure and special event fees for certified farmers' markets in their districts. Effective July 1, 2004, the ordinance would require markets that do not currently have a street closure and vender fee waiver to pay $528 per week in City fees. The purpose of this ordinance is to create a One Stop Special Events Office and to end the practice of waiving fees for "commercial" special events. To the degree that a certified farmers' market is a special event, it would qualify as a commercial event because the food and merchandise sales are for the benefit of the not-for-profit sponsoring the organization. The effect of this ordinance, if passed, would to put most certified farmers' markets located on City streets or property out of business. Southland has alerted the Council offices of its strong opposition to this proposal and will actively oppose the City's efforts to solve its fiscal difficulties by driving farmers' markets either out of existence or onto private property. We urge all City of Los Angeles certified farmers' markets to contact your Council office and express your outrage at this effort to undermine this important program. 4.27.04 -- The City of Los Angeles has gone after growers in the Chinatown Certified Farmers' Market in an effort to compel the growers to obtain a City of Los Angeles Business License and to pay Business License fees for their sales at the market. This is the first effort that we are aware of by the Business License Office to compete growers to obtain a license, report their sales and pay fees on their revenues earned within the City. Southland unsuccessfully appealed to CDFA for a ruling that the growers are participating in a State program and as such are exempt from local regulation. It would appear that baring an initiative by the City Counsel to exempt the sales of growers at certified farmers' markets, the City will continue to insist that growers are required to meet the business license requirements. The Pomona Valley Certified Farmers' Market is having a Health Fair Day in cooperation with students of California Polytechnic Institute Pomona students and volunteers on Saturday, May 22, 2004. Visit the market and learn volumes about nutrition and heath at one of Southern California's finest markets. funded by the Buy California Campaign courtesy of the Southland Farmers' Market Assn. 4.25.04 -- The Southland membership elected six members to three-year terms on the Association's Board of Directors. The membership re-elected Scott Beylik of Beylik Hydroponics; Harry Brown-Hiegel, market manager of several Los Angeles certified farmers' markets; and Mary Hillebrecht, market manager of several San Diego certified farmers' markets. Three new directors were elected: Romeo Coleman of Coleman Family Farms; Armando Garcia of Garcia Organic Farm; and Gail Zannon of Santa Barbara Pistachio Company. 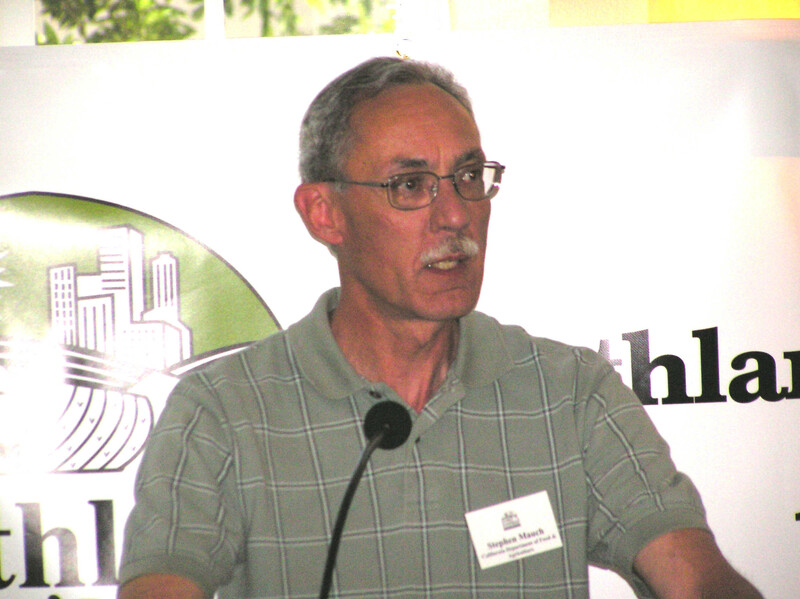 4.25.04 -- On Sunday, April 25, 2004, California Department of Food and Agriculture Director of Inspection Services Stephen Mauch addressed the Southland membership at its 2004 Annual Meeting. Mr. Mauch told the assembly of growers and market managers that in his opinion the greatest challenge facing certified farmers' markets is securing the integrity of the markets. This is not a job that government can solve alone or in a vacuum. In order to deal with the unanticipated growth in the number and variety of markets. Mr. Mauch underscore the importance of the certified farmers' market industry providing timely input on issues of importance. are invited to attend. Enjoy a buffet lunch catered by Carla's Cafe at the CBS Studio Center. Hear the latest about the California Farmers' Market enforcement program and proposed industry reforms. See the innovative promotional programs which are being funded by Southland's CDFA "Buy California" promotional grant. Enjoy a fun and informative afternoon. "State Enforcement Program for Certified Farmers' Markets"
"Reforming California Certified Farmers' Markets"
"Innovative Farmers' Market Promotional Programs"
The Nonagricultural Products Subcommittee of the Certified Farmers' Market Advisory Committee recommends Southland Proposal regarding processed products. 4-20-04 -- On April 19, 2004, the Noncertifiable Agricultural Products Subcommittee decided to recommend Southland's proposed regulation regarding process products for adoption by the Certified Farmers' Market Advisory Committee on May 10, 2004. The text of the Southland proposal appears on the Legislative Voice web page listed in the column to the left. 3-8-04 -- The Certified Farmers' Market Advisory Committee approved a Southland initiated proposals for new requirements on certified farmers' market operators. Under the proposed regulations, certified farmers' market operators would be prohibited from permitting the display or sale of any non-California grown agricultural product in proximity to a certified farmers' market. Operators would also be prohibited from allowing the sale or display of any re-sold agricultural products in proximity to certified farmers markets. In addition, all certifiable agricultural products will be required to be sold within the area designated as the certified section of the market. For more information, see the Legislative Voice section. 3-17-04 -- Southland President Laura Avery and Howell Tumlin have traveled recently to visit with the Board of Directors of the Santa Barbara and San Luis Obispo Farmers' Market Associations to discuss Southland's certified farmers' market reform proposals. We hope to visit with other CFM organizations in California to introduce and explain the reforms we believe are necessary to return the program to its original intention. 2-17-04 -- The West Hollywood Farmers' Market on Thursdays across San Vicente Blvd. from the Pacific Design Center will change its hours to 11:00 AM - 4:00 PM effective February 26, 2004. 2-17-04 -- Howell Tumlin will visit with the Santa Barbara Farmers' Market Association on Saturday, February 21, 2004 to discuss how growers can influence the future direction of the certified farmers' market industry. 01-27-04 -- The decision of Leslie Starus' Appeal regarding what ingredients can be included in processed agricultural products in the certified farmers' market has been issued. You may read the entire text of the decision by clicking Starus Decision. The decision finds that the no processed products may be legally sold in a certified farmers' market that contain any ingredients not produced by the seller, with the exception of ingredients used as "preservatives or are essential in the preparation of the product". The Non-certifiable Ag Products Subcommittee of the Certified Farmers' Market Advisory Committee will certainly take up this issue at its next meeting. 1.21.04 -- The LA County Ag Commissioner's Office has delayed implementation and enforcement of the proposed ten-foot separation requirement between a CFM and non-certified vendors. They will continue to require markets to maintain a clear separation and post signage as needed to alert the public of the boundaries of the certified section of the market. I understand that the County is going to take a closer look at market maps this year and require that the certified market be clearly marked and distinguished from other vending. 12.11.03 SACRAMENTO - CDFA Secretary A.G. Kawamura is announcing eight member vacancies and eight alternate vacancies on the Certified Farmers' Market Advisory Committee. Appointments will consist of five certified producer representatives and five alternates, two certified farmers' market manager representatives and two alternates, and one agricultural county commissioner representative with one alternate. The certified producer representatives must be active in the direct sales or marketing of certified agricultural products at certified farmers' markets. Individuals interested in being considered for appointment as a member or alternate should send a resume outlining their qualifications and relevant experience, and include a letter of recommendation from an industry representative. Nominations will be accepted until the positions are filled. Nominations can be sent to Janice Price, California Department of Food and Agriculture, Certified Farmers' Market Program, 1220 N Street, Sacramento, CA 95814 or emailed to JPrice@cdfa.ca.gov . For additional information contact Janice Price, (916) 445-2180, extension 3510. 12.9.03 - Southland is meeting with the City of Calabasas staff and interested private parties to discuss the need of a true farmers' market in their city. We welcome the opportunity to assist the City in developing a grower-governed, grower-centered certified farmers' market. We will post updates as they occur. 11.25.03 - The Calabasas Farmers' Market growers and customers appeared at the Calabasas City Council meeting last week to protest recent changes in the market. The growers expressed their concern that the new management of the market has introduced peddlers of clothing, crafts and agricultural products at the market. The City recently removed the Calabasas market from a public lot at Park Center and required the market to return to a private parking lot in Old Town. The owner of the lot, Syd Leibovitch, has demanded that the market pay him $500 per week in rent. Southland has asked the City to find a suitable location for the market on public property and recognize that a farmers' market is a community service, not a profit-making enterprise. These sub-grants total $82,070 and will generate an additional matching contribution of $130,641.